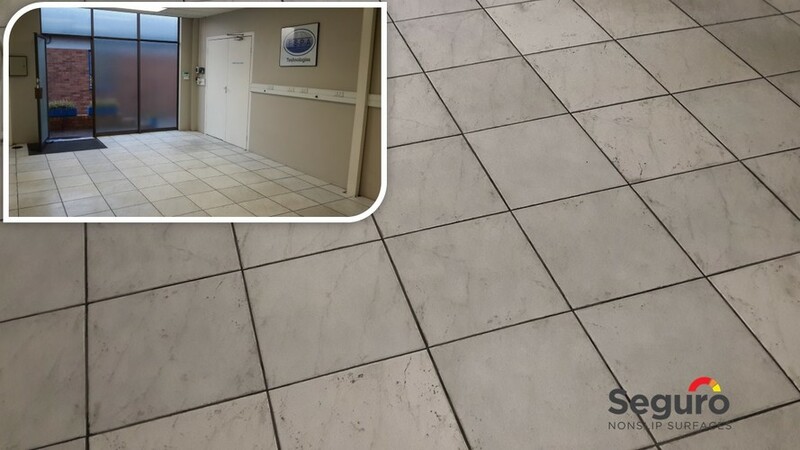 A manufacturing company in Wynberg, Johannesburg, has ceramic tiled floor in their reception. The tiles were extremely slippery when it was wet outside. The rubber mat at the front door was not enough to keep staff and visitors from walking in the water from outside and making the tiles slippery. Seguro Nonslip Surfaces recommended our Titanium Anti-Slip Coating. The coating is environmentally friendly and carries a 3 year guarantee (T&C’s apply). We carried out a demonstration for the client who was nicely surprised at the effectiveness of the coating. The coating was applied successfully and visitors and staff are now protected against slips and falls when the rain comes.